Grate the rind of your Pont l’Evêque with the coarse side of your grater and put it aside in a cool place. With a blender, blend the rest of the Pont l’Evêque to obtain a smooth creamy mixture and season it to suit your palate. Then assemble your Croque-Monsieur entrées on a baking sheet, building up alternating layers of sauce and andouille sausage (two per Croque-Monsieur). Sprinkle with the grated cheese rind and put them in a hot oven (Gas Mark 7-8) for about 10 minutes. Serve your Croque-Monsieur entrées with a salad and a glass of Normandy cider or take them with you for a picnic to eat cold. (1) Croque-Monsieur: this toasted cheese and ham open sandwich is a standard bar snack in France, a bit like a Welsh Rarebit but with ham. 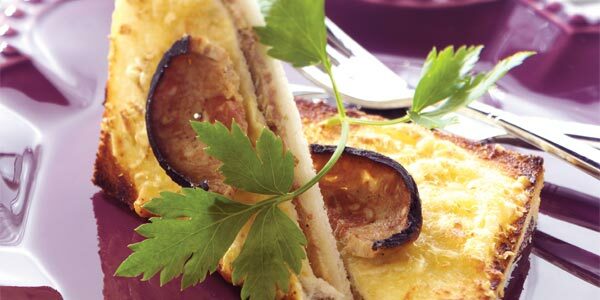 (2) Andouille: this cooked sausage is a Normandy speciality from the town of Vire and the valley of the river Vire.